The Creative Bundle from iZotope contains four music applications and six sound expansion libraries for creating music and a wide range of sound design. Iris 2 is a sample-based synthesizer that combines the power of a sampler with the flexibility of a modular synthesizer. BreakTweaker is a drum sculpting and beat sequencing environment that blurs the line between rhythm and melody. Four BreakTweaker expansion packs are included. Trash 2 excels at audio mangling, distortion, and sonic experimentation. Two expansion packs are included. Stutter Edit comes with over thirty-five preset banks and over eight-hundred gestures for creating fills, effects, sweeps, and stutters. 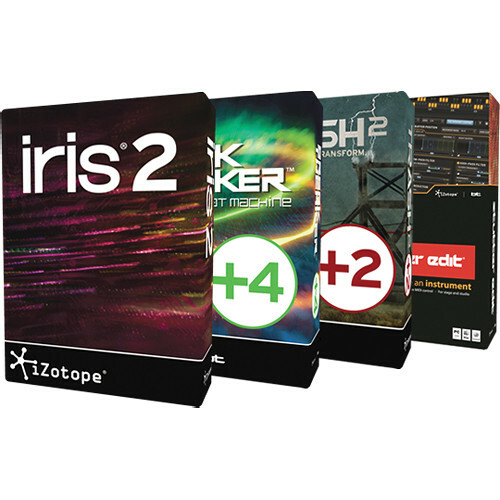 Iris 2 from iZotope is a sample-based synthesizer that combines the power of a sampler with the flexibility of a modular synthesizer, along with spectral filtering. Load one of the hundreds of patches and easily experiment with the most relevant parameters via dedicated macro controls, or develop expressive, dynamic, and evolving musical sounds with the new modulation system. Up to four different samples can be layered from the built-in collection of analog oscillator waveforms, the 11GB sample library, or using personal audio files. Unique filters can be created by drawing, selecting, and isolating sonic components from each sample layer using the company's spectral filtering technology. Access every control from a single window, or open only what's needed with a new user interface. BreakTweaker from iZotope is a virtual instrument for drum sculpting and beat sequencing, compatible with all modern major DAWs. Geared towards EDM producers, DJs, and composers, the software consists of three modules, the Sequencer, the Generator, and the MicroEdit Engine. Assemble pattern-based beats in the sequencer, which features six tracks for layering sounds. The sequencer can store up to twenty-four different step patterns, triggered via MIDI for on-the-fly remixing. Isorhythmic step sequencing makes it possible for each track to have a unique tempo and step length. The Generator is a drum synthesis module, featuring morphing wavetable synthesis, one-shot sample loading, and noise tables. Additional processing includes dual-stage distortions and vintage-modeled filters. Four LFOs with unique wavetable shapes and four envelopes provide extensive modulation possibilities for almost every single generator parameter. Every sequencer track supports up to three generators. The MicroEdit Engine provides a different method of sound design. A "MicroEdit" is the division of a single step within a pattern into potentially thousands of slices. These slices can be contoured and shaped to create harmonic, pitched, and rhythmic effects. Each step can be repeated or chopped at an infinitesimally small rate. A factory library comes with over eighty global presets that are ready for any project. It also features over 2 GB of royalty-free samples designed by electronic production professionals. Optional add-on expansion libraries suited to a variety of production styles are also available. Modern Grooves from iZotope is an expansion library for BreakTweaker drum sculpting and beat sequencing environment, designed by boutique sample creator Black Octopus. The collection of samples and presets provides full-fledged starting points for jamming out new track ideas for producers and songwriters of all types. For situations where unique beats are required, the pack delivers 40 generator presets and 300 samples suitable for electro, breaks, deep house, house drum styles, and more. Vintage Machines from iZotope is an expansion pack for the company's BreakTweaker software drum machine. It features vintage beats that include hip hop, trap, upbeat techno, two step, Dilla-style off-kilter, and much more. Over two-hundred samples represent many of the greatest drum machines out there, assembled into fifty kits with twelve patterns each. Cinematic Textures from iZotope is an expansion pack designed to enhance film and television scores, as well as the textures of electronic and electro-acoustic music. It features a collection of rhythmic material ranging from esoteric patterns to dense pulses and beats, and although they can be used anywhere, the sounds are mostly geared towards composers, producers and sound designers. The pack includes 71 presets and over 700 samples. Kicks and Snares by Beatport Sounds from iZotope is an expansion pack for the company's BreakTweaker software drum machine. It features kick and snare samples, along with a little percussion, and is the perfect expansion pack for creating modern drum productions. The iZotope Trash 2 Distortion Software is primed for an era of audio mangling, distortion, and experimentation. It features sonic architecture, optimized performance, better sound quality, and support for modern hosts and formats. Trash 2 combines the power of multiband, dual-stage distortions, and advanced post-filtering for immediate sonic transformation. Trash any track and not just guitars and basses, but drums, synths, pads, vocals, brass, woodwinds etc. Two expansion packs are included, further expanding the sonic possibilities of the software. Design your own distortion algorithms with Trash 2's customizable Waveshaper; simply draw in, tweak, and create infinite distortions. Load one of Trash 2's 60+ distortion algorithms and adjust at will. The power to morph sound from one object to another is available with the Convolve module. Convolve includes over 100 impulse responses (IR): a collection of amps, objects, animal sounds, and mouth shapes for transforming your sound. Moreover, you can concoct a unique convolution and load any WAV or AIFF file into Trash 2. Explore the sonic dimensions with the Filter, Delay, and Dynamics modules. Breathe life and movement into your audio using the dual filters, each with 20+ evocative filter types to shape your tone. Modulate, invigorate, and apply exotic filter sounds, and then control and manipulate each node with LFOs, envelopes, and side-chaining. With a filter bank, you are free to custom design your filter styles. Polish it all off with Trash 2's organic Delay options and the analog-modeled compressor. The heart of Trash 2 is its dual-stage multiband waveshaping distortion, which allows you to chain pairs of distortions together for sonic manipulation. Split the signal into multiple bands and apply distortion independently to individual frequencies, each with their own custom waveshapes. Use the new Waveform Trace to see exactly how you're mangling your waveforms in real time, and DC offset filtering to keep them centered and on track. Two redesigned filter modules to drive the frequencies you want into distortion or tame the ones you don't want. Shape the tone and customize it with re-engineered Filter shapes and Vowel Filters. Additionally, the software features realistic amp, device, cabinet, effect, and speaker convolution modeling, freeing you to place your audio into another space (or object) entirely. Choose from classics, combos, boutique models, and stacks, or play with creative synthetic impulses from a number of different sources including telephones, clock radios, sheet metal, plexiglass tubes, piano cabinets, tin cans, and more. With the Convolve module, you can teleport your sound wherever you please by loading in your own audio files. Trash 2 includes a multiband Compressor and Noise Gate to squash the peaks, add grit and character, silence the noise, or draw out sustain. With the addition of sidechaining support, multiband processing, and an updated compression algorithm, the Dynamics module is a powerful tool. Go a step further by using a classic lo-fi Delay. Choose from delays that include tape delay with saturation and nonlinear tape machine artifacts, tape-tube delay with added tube saturation modeling, classic analog delay with analog degradation, and lo-fi digital delay with quantization noise and aliasing. Chain 2 distortion algorithms for each frequency band for up to 8 different flavors of destruction. Load your own custom Impulse Response using any WAV or AIFF file. Trigger the Compressor or Gate via external sources with side chaining support, even to individual frequency bands in Multiband mode. Trash your audio easily with a fully re-designed UI that makes more controls accessible. Trash your audio safely with the Output Limiter. Classic Textures from iZotope is an expansion pack for the company's Trash 2 distortion plug-in. The expansion pack adds over thirty additional impulse responses and seventy new presets for processing virtually any source. Edge from iZotope is an expansion pack for the company's Trash 2 distortion plug-in. The expansion pack adds thirty additional impulse responses and seventy new presets for processing virtually any source. Suitable for a broad range of sonic treatments that include bit-crushing and filtering, the expansion pack is especially useful for creating unconventional guitars, synthesizer basses and pads, for drum mangling, and more. Stutter Edit from iZotope is a plug-in designed developed in cooperation with BT that allows you to play its effects like an instrument. It provides audio slicing and manipulation along with elegant and intuitive MIDI control. It allows you to build fills, complex effects, shimmering sweeps, and stutters in real-time. Stutter Edit's features revolve around an innovative engine that continuously samples live audio, storing that audio in a buffer that can be manipulated in a myriad of ways. The software works using" Gestures", a set of effects and their associated timelines that reside on a single MIDI note. The audible result can vary from simple to complex. Condensing these effects into a single key press is what makes Stutter Edit so playable, especially with its intelligent sense of timing. The plug-in is suitable for laptop performers, producers, sound designer and musicians, whether working in electronica, hip-hop, pop, or beyond. Combine real-time sampling and audio chopping with a range of versatile color effects—trigger Stutter Gestures back-to-back to create limitless combinations of rhythmic variation and audio decimation. Stutter - repeat audio at a rhythmic note value; create incredible sweeps that transition from one rhythmic value to another. Quantize - sweeps between note values continuously; with it on, you can create stepping effects that transform your audio into complex rolls, trills and even arpeggios. Gate - achieve intense chopping effects that modulate in sync with your track by gating each individual event created by the Stutter module. Filters - shape the sound of each key-controlled Gesture individually. Perfect for cutting the bass, making aggressive resonant sweeps, or creating LFO-like modulation that locks to each Gesture's timeline. Stutter Matrix - choose from a note value from 1/4 to 1/1024 for the stutter module to sweep or step between; you can also make your audio repeat at a high enough frequency to turn it into musical pitches. Buffer Position - use this slick radar screen to choose where Stutter Edit pulls audio out of the buffer; dice drum loops, jump between notes in a vocal phrase; you can even randomize playback order for unexpected results. Bit Reduction - digital distortion or add a periodic growl and will in sync with the tempo if required. Pan - send stuttered patterns flying left and right at breakneck speeds, or create subtle width and doubled audio that sweeps side to side. Lo-Fi - adjust the settings to get a "vintage digital" vibe or bury the whole track in fuzz. While Stutter Gestures process audio, Generator Gestures mix noises and crashes with your tracks, providing the ideal tool for creating washes of noise, dramatic build-ups, and hits that add excitement to a track. For performance, choose where you want the Generator Gesture to end, and no matter where you trigger it, it will intelligently stop on the perfect beat. You can even hold a Generator Gesture as you jump between different Stutter Gestures—the result will be an improvised arrangement that sounds like you've spent hours toiling in the studio. Pitch - scale the pitch of the Generator's noise tables over twelve octaves automatically. Build tension, or drop a track into a breakdown with a downward swoosh of noise. Band Pass - the Generator can automate this resonant band-pass filter to shape and squelch blasts of noise. Global Filter - grab the Pitch Wheel of your MIDI controller to engage a dual low- and high-pass filter; push it up to cut lows and add resonance, push it down to roll off highs and bring things down to a low rumble. Lo-Fi - for a little more bite, add some Lo-Fi to a Generator Gesture for a grainy, gritty noise wash or stab. Timeline Override - while Stutter Gestures automate everything in sync to the beat, you can also take control of the Gesture timeline with Timeline Override; grab the Mod Wheel of your controller to hijack the motion of all of the modules at once; improvise wild rolls, fills, transitions and even "freeze" the Buffer Position.